What I love most about this unique story is the connection to family and the past. 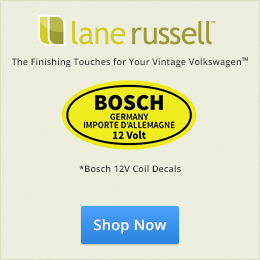 I believe that’s why 1967beetle.com has grown in audience. 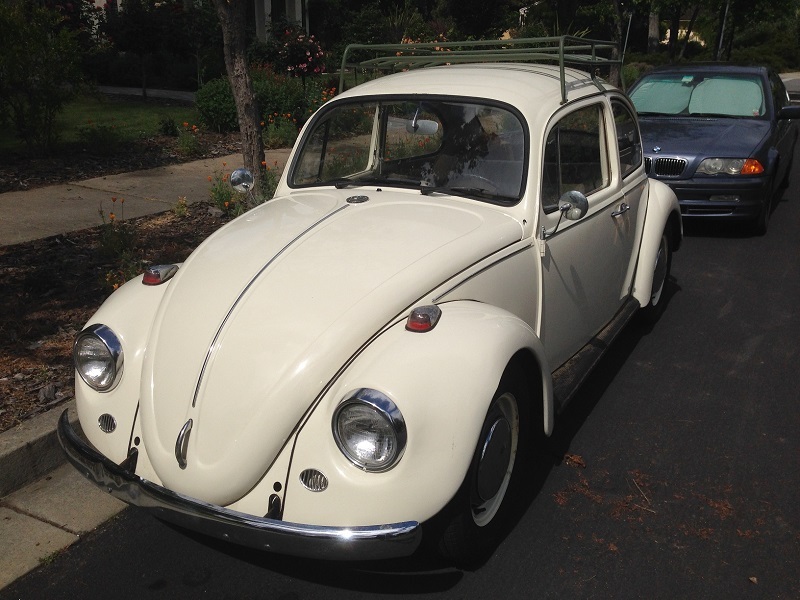 So many people have a vintage Volkswagen history. We will continue to find these stories and share them with the world. 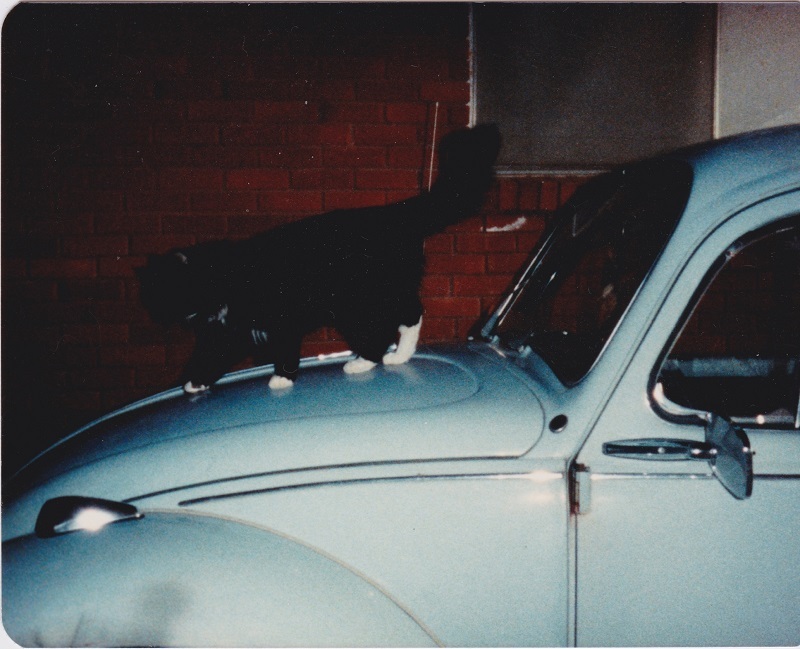 During the late autumn of 1966, my father, US Air Force Major Charles Jaeger, visited a dealership somewhere near Pope Air Force Base in North Carolina and purchased a brand new Volkswagen Beetle. It was baby blue and magically German. He called it Fritz. Fritz became our family car and safely chauffeured us around the base, through the woods of North Carolina, and along the Eastern seaboard with my sister and me – two toddlers – asleep in the back. Our earliest memories featured Fritz. I remember our favorite children’s book was about a VW Beetle. We insisted it be read to us over and over again. (Unfortunately, the book and title are lost to time.) Another early memory of Fritz was when my two year old sister, overcome with excitement about a trip to the circus, banged her head into the edge of the passenger door as she rushed into the back seat. Tears and blood followed along with a trip to the emergency room. Although the much anticipated evening was cancelled, I got an hour of carnival rides with my dad – a memory I still cherish. In 1968 as the war in Vietnam heated up, my father received orders to report to Naha Air Force Base in Okinawa, Japan. The whole family followed. Fritz was invited too. He took his trip across the Pacific on a cargo ship, but arrived safe and sound a few months later, much to our delight. He took on his usual job with stoic German tenacity, trudging down the dusty island roads through the crowded traffic of Naha, past stinky “benjo” ditches and three-wheeled Japanese trucks. He endured typhoons, a couple of fender dents, and a touch of tropical rust but remained a handsome car. By January 1971 my father had retired from the Air Force. We flew back to the US (along with Kevin, our new baby brother) for a temporary home with my grandparents in New Jersey. Fritz arrived by ship a few months later in good condition but missing his original Sapphire radio, compliments of a sticky-fingered sailor. We were just happy to have him back but Fritz was ready for one more adventure. After much family discussion, we decided to make Idaho our permanent home. 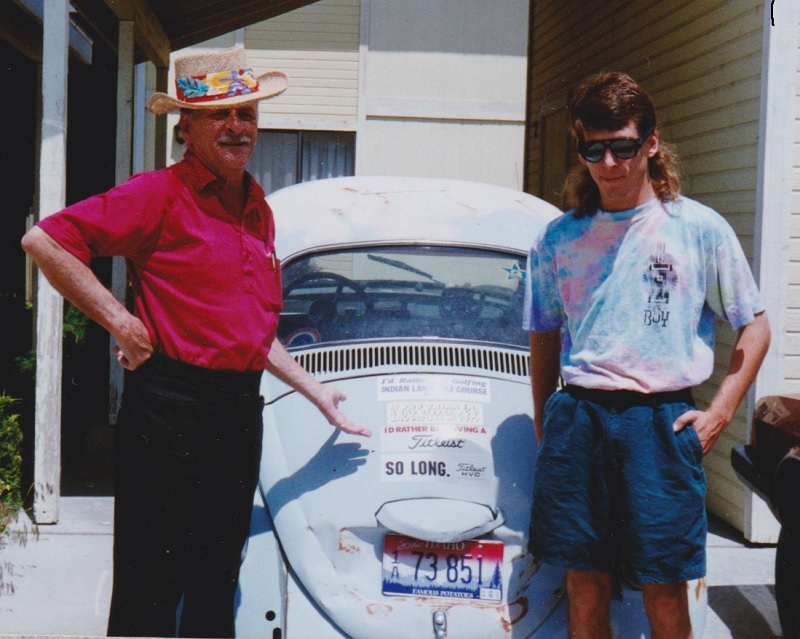 To prepare the way, and find a suitable house, my dad and Fritz left a few weeks early for an epic 2,500 mile solo car trip from the East Coast out to Boise, Idaho. The one detail I remember from my Father is that he flattened three tires on the trip – two of them within a half hour near Indianapolis. In the sweltering late spring sun the asphalt began to melt, causing the VW jack to sink into the tar. My father improvised by stacking a couple of his many books under the jack. For years I would occasionally come across one of his books embossed with a large ugly circle on the hard cover. Eventually Fritz made it to Idaho. Incredibly, Fritz stopped driving. Instead he sat under our carport for many years, hobbled by a battery problem my father couldn’t deal with. Fritz’s revival would have to wait on the awarding of my driver’s license and a bargain: I get the car running and he’s mine. With the help of a friend, and a few weekends, the 1500 fired up and Fritz became a teenager’s “first car.” Equipped with a new stereo and box speakers to replace the stolen radio, I drove Fritz throughout high school and college. My friends were packed in the back, my girlfriend tucked close, everyone without seatbelts. The heavy metal was often cranked. Whether off to drive-in movies and concerts, up high mountain roads, and through late night, snow-logged, pizza deliveries, Fritz was as reliable as ever. But after just four years, Fritz was banged up, crunched, rolled, and rusted, a worn out vestige of his former glory. 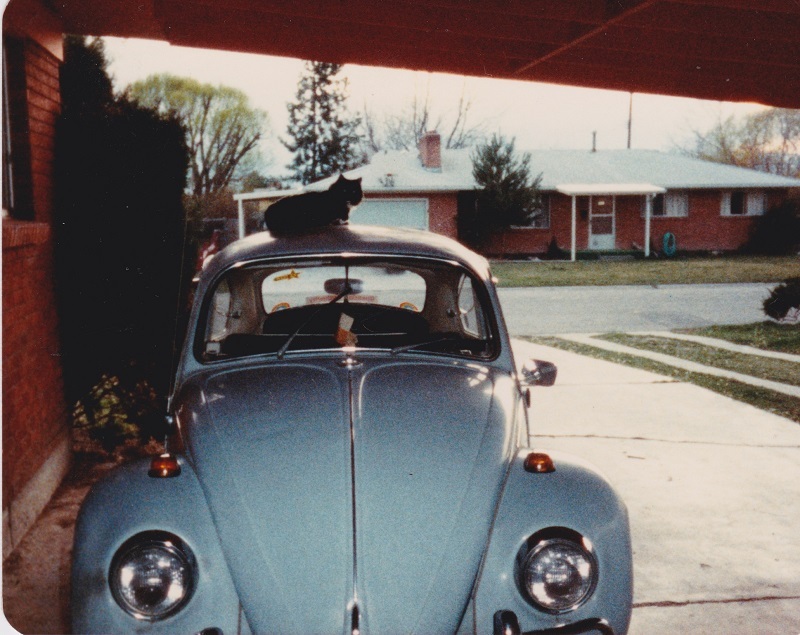 In 1984, seeking more reliable transportation for a long trip to Texas A&M University, I traded the car back to my father for his 1971 Squareback. Poor Fritz limped on until the late 1990s and was finally carted away for his parts. Dad passed away two years later. All that remains of Fritz is his original metal “Volkswagen” decklid emblem, safely stashed in my father’s old wooden footlocker, alongside photos, military records, medals, and maps. My new ’67, originally red, is now white with newly upholstered seats and is in very good condition, despite sitting inoperable for eight years. The car is a jumble of “other” cars: a Mexican engine, a Brazilian carburetor, a chrome air cleaner (no oil bath! 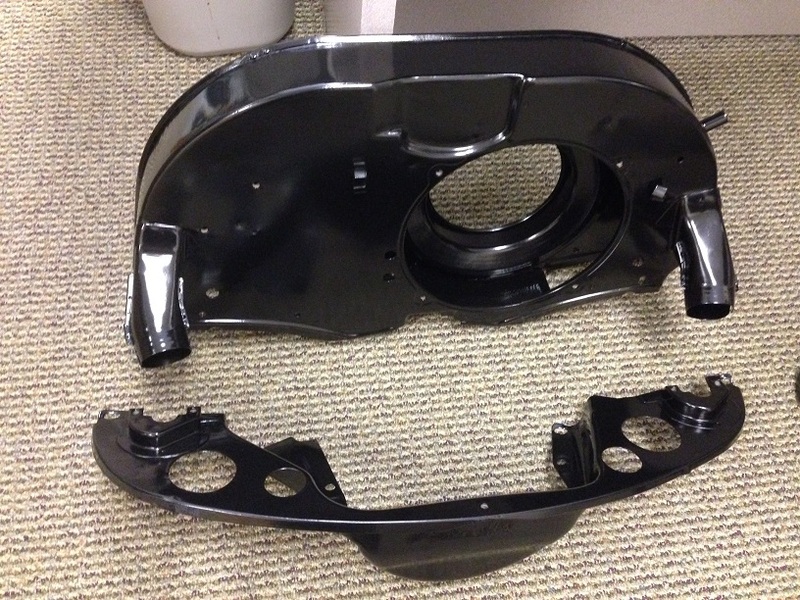 ), cheap aftermarket bumpers, a 1966 horn ring, and aftermarket rubber gaskets that bleed black with every wash. All of the interior elements are gone. No straps. No mats. No dome light. 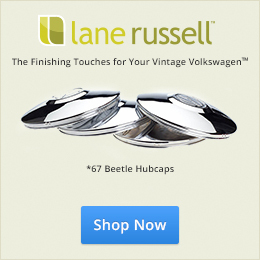 The fan housing and cylinder covers are chrome and more suited to a dune buggy than a classic VW. And no heater ducts! Because of his current condition, and in honor of the original Fritz, I’m calling this one Frankenfritz…at least for now. 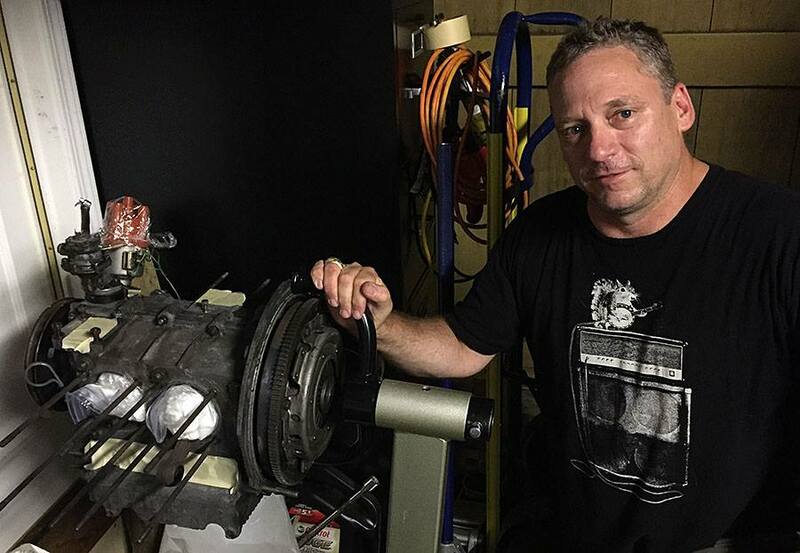 Over the last year I have refurbished the gas tank, replaced the brake system with German parts, sleuthed out an original fan housing from eBay, picked up some refurbished cylinder heads, and procured the proper 30 PICT 1 carburetor from Lane Russell. By the end of this summer Frankenfritz will rise from the dead. 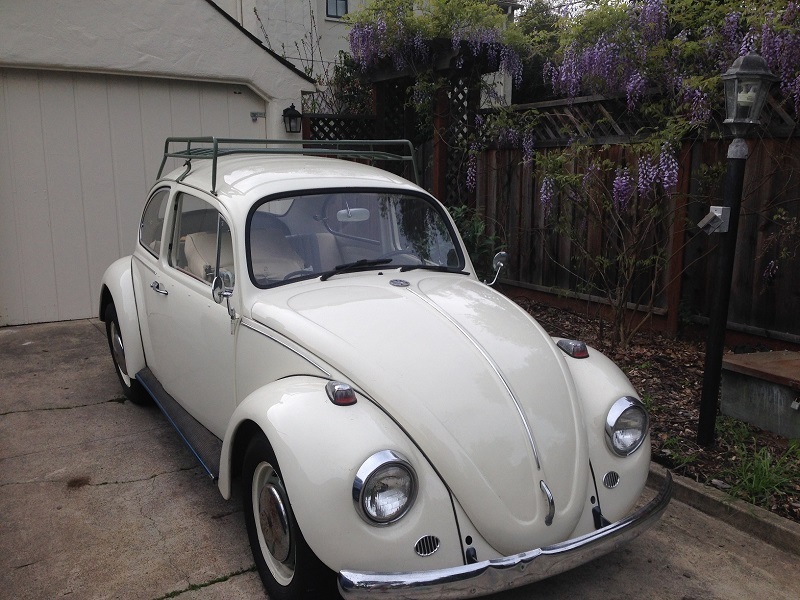 Thanks, Stephen, for sharing your story with 1967beetle.com. Stephen, Great story, and thanks so much for sharing it. A huge thanks to your Dad for his service. This is a wonderful story! You’re a good writer. Please keep us posted on your progress. Well this is a story worth sharing for sure. Well all the best wishes, and luck to you, and your new to you memory maker Stephen ! What a journey! I served with the Marines in and out of Futema which gives me a huge appreciation for Fritz’s travels there in Okinawa! Sad that Fritz was not able to make the entire journey to the present day, but they all can’t be saved! Glad you are saving Frankenfritz! Good luck! I still wear Bugle Boy. What are you trying to say? The dude with the mullet is my baby brother circa 1995. Of course I had one too in the day although maybe not quite as bold as Kevin’s! Thanks you all for the kudos. 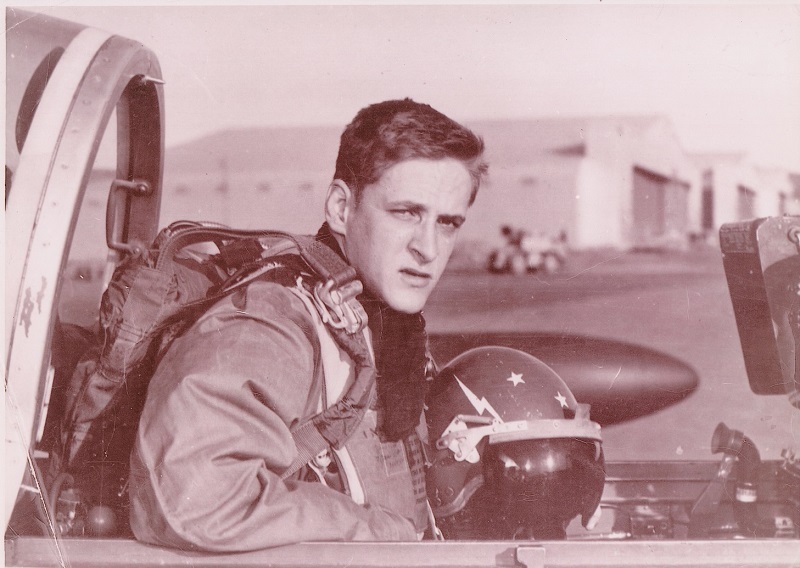 My father loved his time in the Air Force and he loved Fritz. The two go together. I will send updates on Frakenfritz’s progress from time to time. Never sell this car.. Ever.. I picked up an old copy for my kids a few years back. Thanks, Steve. Yup, that was the book. I just looked it up. I haven’t seen it in over 45 year! Funny story about this: When we got to Okinawa we were constantly bugging our mother to read us “Volksy.” She said the book was “in storage” back in America. So, sure enough, when we got back to the States 3 years later, we asked about the book. It apparently never made it into storage. I suspect my mother, sick of reading the insipid thing every night, promptly gave it away when we left North Carolina and hoped we’d forget about it. She was wrong. Excellent story! Really enjoyed reading it. I drove all kinds of junk when I was in the service (USN -Submarines) including some old bugs and some old Porsche’s. I beat on cars so bad when I was young that I should be punished today and not allowed to drive, although I’ve mellowed with age. I had a ’54 sunroof couple with an 1100cc in it that had to be thrashed just to almost keep up with the traffic. Wish I had that car back today! Thanks for the story and thanks for your dad’s service!!!! Good luck with the new memory maker! Awesome story Steve. I wish I would have gotten to know your dad better. Enjoyed the times we spent running around in Fritz. Ross, those were good times indeed. I have been driving FrankenFritz around. He is bumpy, cramped, and loud (very much like the little Cessnas I used to fly.) As much as I love my bug I am also appreciating the modern comforts of my BMW.